A medium-sized antelope found in the savanna and woodland habitats of eastern and southern Africa. Impalas move in big herds as a strategy of protection against predators. If one impala detects the presence of a predator (a lion, for example), it will bark an alarm, and the whole herd will promptly flee. Impalas are fast runners, can leap in bounds as long as 33 feet, and soar up to 10 feet in the air. The impala is known and coveted for its long, curved horns. Due to extensive hunting, loss of habitat, and interbreeding, it is now declared an endangered species. 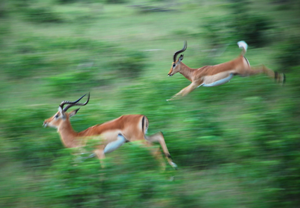 "Impala running, Chobe National Park, Botswana, March 23, 2011" by Caroline Granycome. N.d. Impala. http://www.arkive.org/impala/aepyceros-melampus/, accessed September 29, 2014."